I’ll admit I’m a bit of a baby when it comes to bearing the cold. I’m the girl in the gloves and scarf when the temperature drops to 50 degrees. And once we get near freezing and if precipitation is involved, I may not even leave the house (read: icepocalypse 2011). I’m perfectly content on the couch with anything warm — soup, tea, flannel PJs, a comfy blanket and some good company – be it a person, book or TV show. On Sunday I made a big pot of chicken soup for the week. It’s simple. It’s warm. And the best part is it’s in the fridge, ready and waiting to warmed up for dinner. 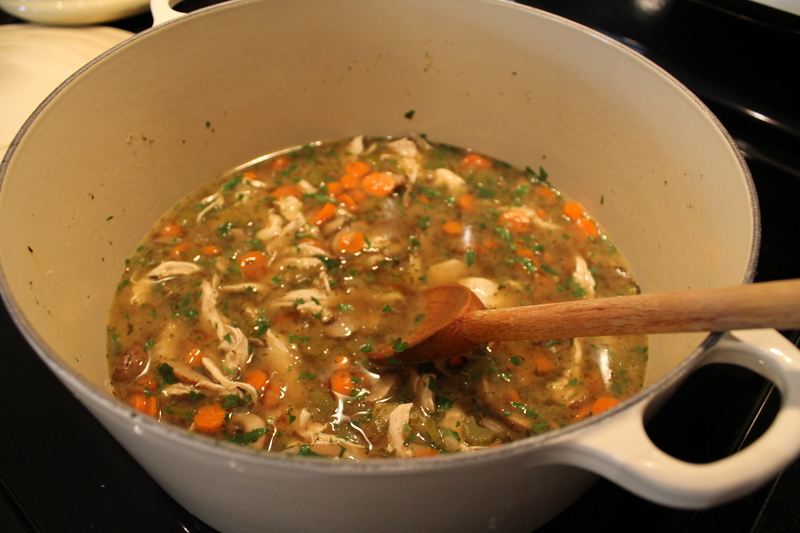 In a large pot, pour 1/2 cup chicken broth and bring to a simmer over medium-high heat. Add chicken and poach 4 min per side until opaque. Remove chicken and broth from pot and shred chicken, set aside. In the same pot, heat olive oil over medium heat, add onions and garlic and saute 2-3 minutes. Add mushrooms and thyme and saute 7-8 minutes. Add carrots and celery. Pour in remaining broth and stir. Cover and allow to simmer until vegetables are tender, about 20 minutes. When vegetables are tender, return chicken to pot. Add parsley and salt and pepper to taste. If you want to make it a bit heartier, add some cooked brown rice. Enjoy now or store in the fridge to warm up later (it’s always better the next day). I am on a total soup kick. I recently made a chicken and mushroom soup with a touch of cream and sherry. It was AMAZING. The recipe is on my site if you feel like testing it out!